US stock market logged solid gains Thursday as Apple led technology sector rebound. The S&P 500 added 0.5% to 2904.18. Dow Jones industrial average rose 0.6% to 26145.99. 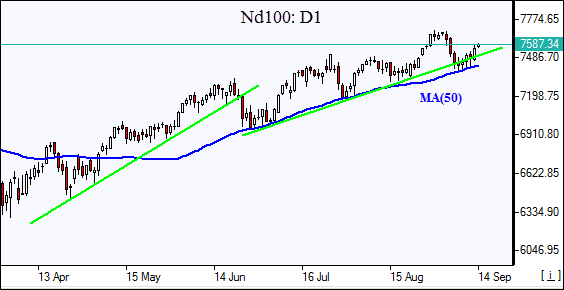 The Nasdaq composite climbed 0.8% to 8013.71 with Apple jumping 2.4% a day after unveiling its new product lineup. The dollar weakening continued at the same pace as the August consumer price index came in 0.2% higher, compared with an expected 0.3% gain: the live dollar index data show the ICE US Dollar index, a measure of the dollar’s strength against a basket of six rival currencies, fell 0.3% to 94.516 and is lower currently. Futures on main stock indices point to higher openings today. Asian stock indices are higher today as China welcomed US offer to renew trade talks but warned it would not surrender to US demands. Nikkei ended 1% higher at 23042.83 despite a yen climb against the dollar. Chinese stocks are lower after report fixed asset investment was slowest in 25 years: the Shanghai Composite Index is 0.2% lower while Hong Kong’sHang Seng Index is up 1%. Australia’s All Ordinaries Index rebounded 0.6% despite Australian dollar’s persisting climb against the greenback slowed. Brent futures prices are extending losses today as Hurricane Florence weakened ahead of its expected landfall on the US East Coast. Prices fell yesterday after the International Energy Agency monthly report showed global supply of crude oil hit a record of 100 million barrels a day in August. Prices ended lower: Brent for November settlement closed 2% lower at $78.18 a barrel on Thursday.